This article had been entitled "Completing the tests for on() and trigger()". That was from an earlier - more ambitious - draft. I do not finish the tests for on() and trigger() in this article. I only get about half way, I reckon. I have updated the title (but not the URL) accordingly. In the last entry I finally got on() and trigger() actually doing what they were supposed to do (in a very limited way), which is good. However they only work with a single event. Time to sort that out. "testOnStoresMultipleEvents1 should have been created"
"testOnStoresMultipleEvents2 should have been created"
All we're doing here is doubling up the previous test: adding handlers for two events instead of one, and making sure each do the thing they're supposed to. All I've done here is to make the eventContainer be a struct which is keyed on the event name, instead of just containing the one event handler. I think it's safe to say that one could predict that the previous iteration of this code was never going to see production - it only handled one event and one handler - but this is OK: what we were able to test is that a handler was being "registered", and having done that it could then be called when the event for it was triggered. This is a win. and from there we're just changing the data structuring hold in the registered event handlers to accommodate more than one event (and shortly, more than one handler per event). There's no tests in TestBase.cfc, I'm just setting the baseline environment up. The other CFCs extend this one, to inherit that baseline. TestCreateEventObject.cfc tests the returned struct from createEventObject(), the method signatures of on() and trigger(), but not the behaviour of either of those functions. "testOnStoresHandlerResponse should have been created"
TestOn.cfc has the tests we've written in the last article and so far in this one. 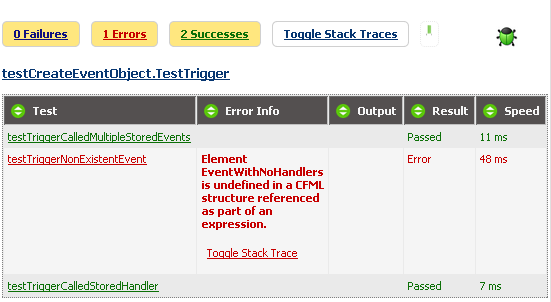 // currently trigger() tests are actually performed as part of the on() tests. For the sake of completeness, I have also implemented a TestTrigger.cfc. Currently all this CFC has is placeholder tests which simply call the on() tests that use trigger(). This is a bit of an code execution double-up, but when we run our battery of tests, we get flagged up that trigger()'s behaviour is actually being tested, if only by proxy via other tests. Because for the trigger() tests to work I need to call the associated on() test, I need to actually instantiate the TestOn.cfc and run its test methods directly. And to do that I have to call its beforeTests() and setup() too before each trigger() test. This is quite an "interesting" approach I'm taking here, and not one I've tried (or needed to try) before. 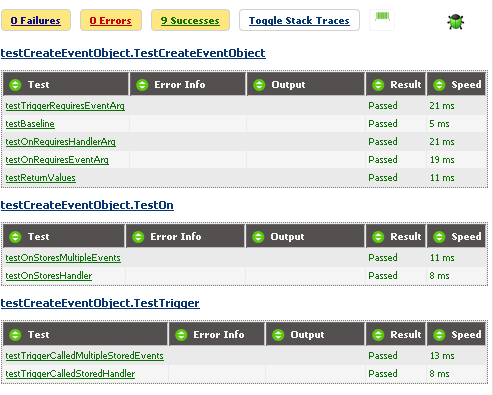 Now when we run our testTriggerNonExistentEvent() test, it's green. And we can run the rest of the tests and there's no regressions from this, as all the tests are green. Here's the cool thing about an iterative TDD approach: we find bugs... or lack thereof as we go. I know that the change I just made does not interfere with any other functionality. The code is solid (at what it sets out to do). Note: it's completely OK that when an event is triggered that simply nothing happens if there are no handlers bound to the event. This is what we want. If a tree falls in a forest and no-one is there to listen to it, did it make any noise? In this case: we don't care. Sorry tree. "testOnStoresMultipleHandlers1 should have been created"
"testOnStoresMultipleHandlers2 should have been created"
This still happily supports a single event with a single handler, and multiple events with a single handler. Now it also supports multiple events each with multiple handlers. We know this, because all our tests are green. That seems like a suitable juncture to finish up this article. This code is now functional for dealing with as many events as we like, with as many event handlers on each event as we like. So this is actually usable code now! However we also need to be able to pass data along with the handler and the trigger(), which we'll implement next. All the code for this will be committed to github, although I have to admit I'm a bit further ahead with the code than I am with the blog, so it's current state has code for the next article in it. I'll get cracking with the next article soon. I'm over in Galway this weekend, so I do have plenty of time to spare between my visits to see my son. And the rugby season has finished (the All Blacks finished 2013 going unbeaten... did I tell you that? Indeed they've only lost one game since the last World Cup, whilst I'm talking about them. One loss, one draw, and something like 24 wins I think. They are a truly awesome rugby team). So, anyway, no rugby to watch so I'll probably focus on the blog more than I have been for the last coupla weekends.